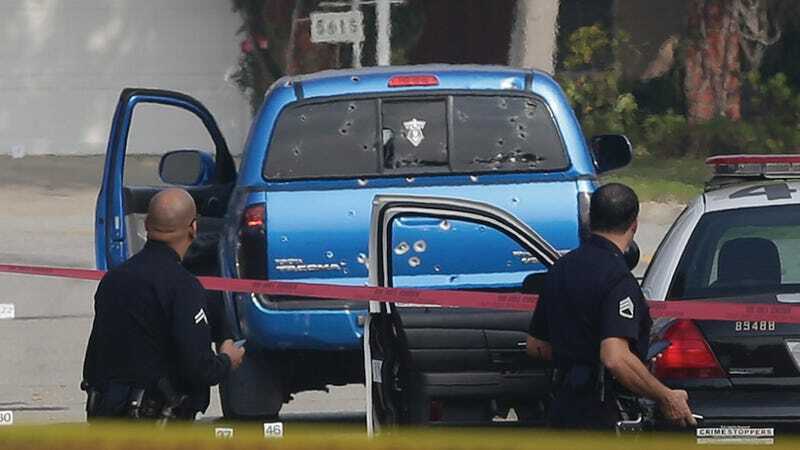 The mother and daughter who had their truck riddled with bullets when the LAPD mistook their vehicle for that of Christopher Dorner this past February during the manhunt for the homicidal ex-cop have been rewarded $4.2 million to split between themselves by the city of Los Angeles. Margie Carranza (47) and Emma Hernandez (71) were delivering newspapers in their blue Toyota pickup truck at 5am on February 7th when they encountered police officers who were on the look out for Dorner 's Nissan Titan. (Note: the only thing these vehicles have in common is that they are both trucks.) Police then shot approximately 100 rounds of ammo into the women's car, shooting Hernandez in the back and injuring Carranza with the shattering glass. The women's (very clear cut) case against the city was closed before ever going into litigation and the pair, though still traumatized, are satisfied with their settlement. "The deal is relatively a very simple, very clean deal. It's a win-win for both parties. It closes this chapter in Los Angeles and LAPD history on all issues," LA City Attorney Carmen Trutanich tells NBC4. "If this case went to litigation it would cost the city a minimum of $5 million just with defense costs," Jonas said. "And potentially – being conservative – maybe somewhere in the neighborhood of $15 million total." The city council must first approve the settlement before Carranza and Hernandez will receive their payout, which is over four times the reward for Dorner's capture. Safe to say they've earned it.